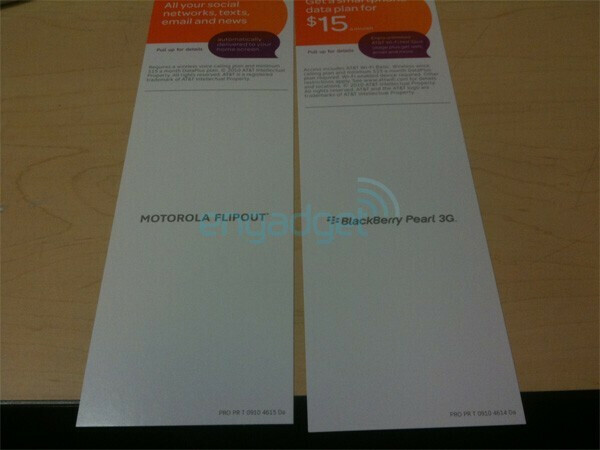 Motorola FLIPOUT for AT&T out this weekend with more WP7 & Android sets later? Zipping by the halfway mark of the month, we are slowly inching ever closer to that perennial time of the year when we begin to see an onslaught of new devices beginning to make their presence in time for the holidays. Apparently AT&T isn't waiting around any longer to kick start some things as it's being reported that the carrier will have the Motorola FLIPOUT available for sale this weekend. Of course that should probably come out as being good news, especially when it flew by under the radar, and now instantly pops back into the spotlight as it appears as though AT&T stores are preparing for its anticipated roll out. Not only will customers be able to purchase one this Sunday, but the LG Neon II is also looking to make a surprise visit as well. The device is going to be replacing the long time LG Neon which was released last year for AT&T – so it wouldn't surprise us to find it being a quick messaging handset. RIM already launched its most galvanizing smartphone, the Torch 9800, but it's being supplemented with the BlackBerry Curve 3G and Pearl 3G which should both make some waves starting on October 3rd. On the same day, it's revealed that the Pantech Laser should also be making its presence as well, but unfortunately there are no specifics regarding the handset. However, you may want to circle down October 17th because it's rumored to be the day when AT&T will be launching two new Android devices from Motorola; the “Bravo” and “Flipside.” Sure we're once again left in the dark regarding specifics between the two Android powered Motorola handset, but the “Flipside” sounds eerily similar to something like the FLIPOUT. Finally, there is more evidence of Windows Phone 7 persistently making itself known in the flesh on October 17th as well since it's speculated that Samsung will be outing two devices that will be coming out close to the time when WP7 is expected to launch officially. These two smartphones, the “Patek” and “Universe”, would seemingly clash head-on with the other two Android devices from Motorola – making for one interesting day to see which platform will have the leverage over the other. Whatever comes to fruition, we're sure there are already some AT&T customers out there with some big smiles on their faces knowing that the carrier isn't going to be skimping out on handset offerings this fall.